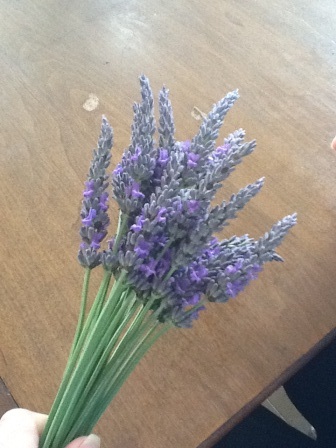 Lavender Season – a delight to behold! We moved into our home four years ago. My husband and I really like living in the country, and our home suits us just right. 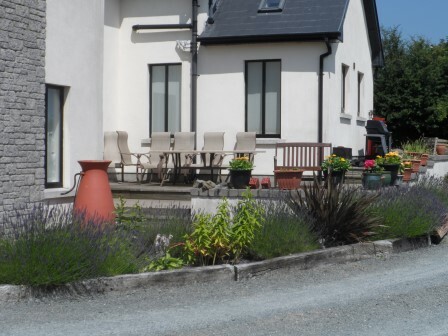 The yard was more or less a blank canvas for us, except for the established lavender garden. What a treat! Lavender! So pretty to look at, and a scent to match that beauty! Our first summer here, one of my sisters-in-law suggested I dry the lavender. I’ve been drying it and finding different things to do with it ever since. I have really grown to love it. It is so fragrant that I don’t even need to brush past it to enjoy the scent; it is already wafting in the air. It truly is a relaxing fragrance too. 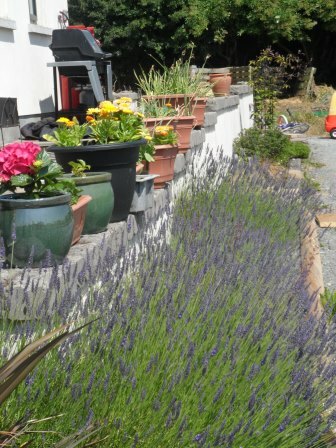 Someone with so much lavender in their yard surely has to do something creative with it! I surprised myself last year with the number of lavender wands I made. 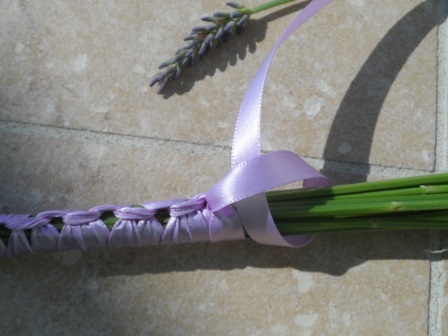 The colors of the ribbons I used to weave the lavender were so pretty to work with. I shouldn’t forget the wreath, either. I was really delighted with how it came out. This year I just haven’t had the time to spend on crafts, unfortunately. That is a huge unfortunately, because I really enjoy making things with my hands. Even after working long days, it has been so wonderful to go into the garden and cut lavender. The lavender I just planted last year was the first in need of cutting. I can’t believe how much it grew! Lavandula angustifolia Lavender. It was just a bit bluer than my established lavender, and the blooms were a bit thinner, too. But still beautiful. I bet you didn’t think I could pose this many pictures of lavender, now did you? Even the different times of day give it a different appearance! 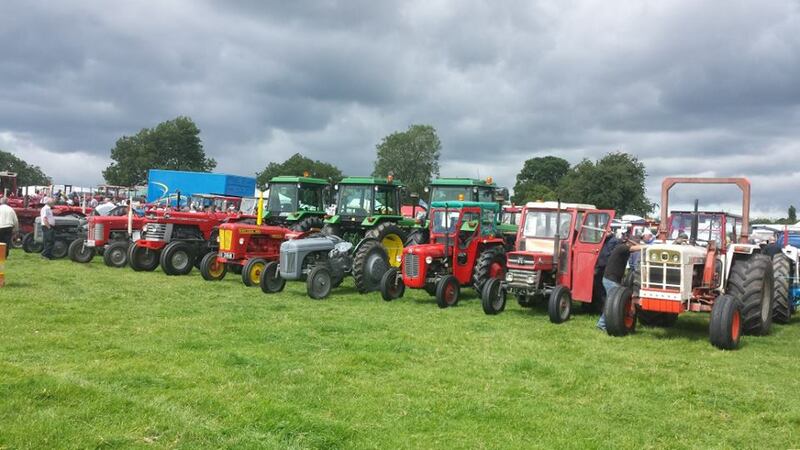 Moynalty Steam Threshing Festival … Just like the old days! My husband’s father’s family is from Moynalty, County Meath. It is a lovely, picturesque, quaint village. 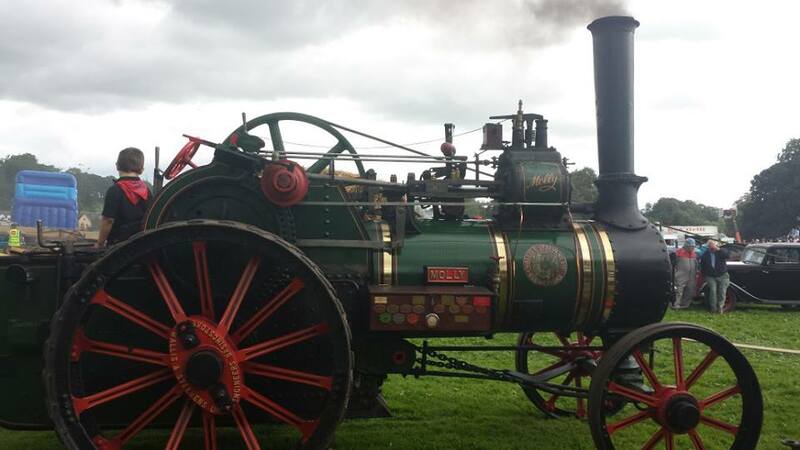 And every year, for the past 38 years, they host a Steam Threshing Festival which attracts upwards of 30,000 people. It is always an enjoyable afternoon, and this year was no exception! I’m not a farming girl myself, so everything had to be explained to me. 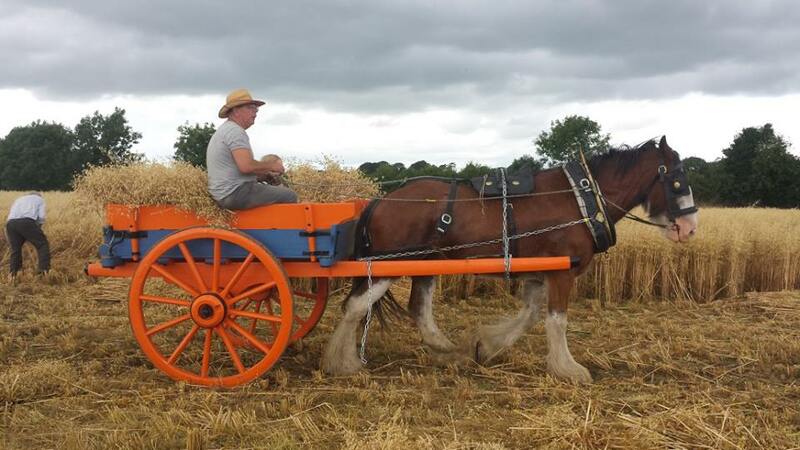 Threshing is the process of beating the stem of the grain to separate the grain from the straw. 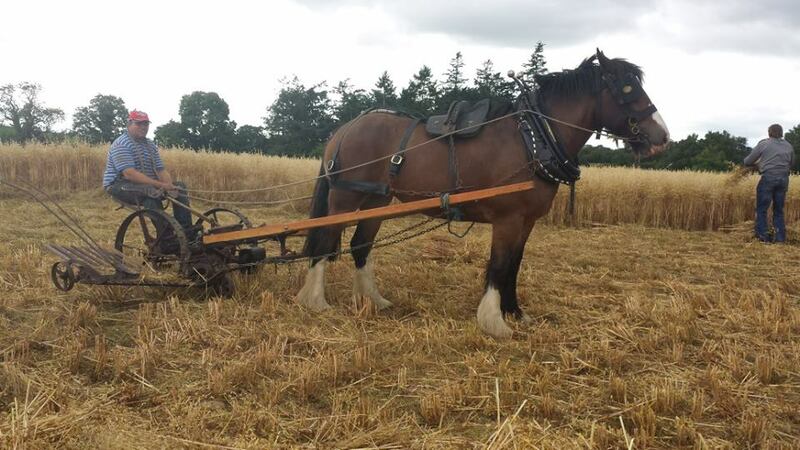 Long ago, this was done by beating it by hand using a flail, but this graduated to using threshing machines powered by horses, and then later by steam engines. 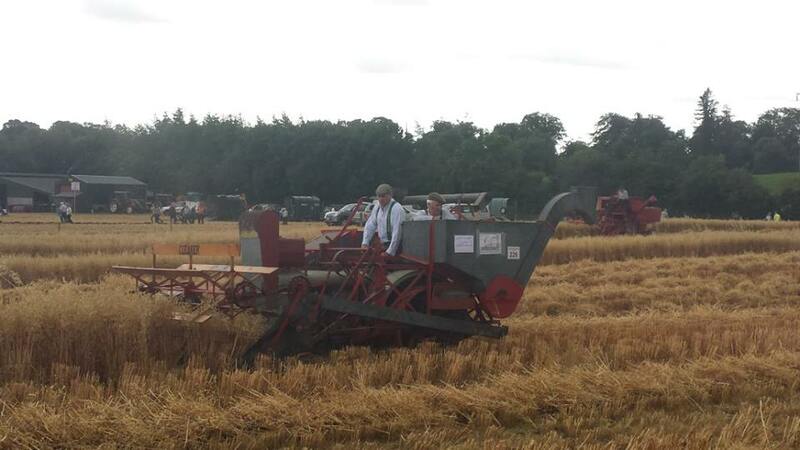 Today, combines are used. There is a tremendous amount of work involved, no matter which method is used! 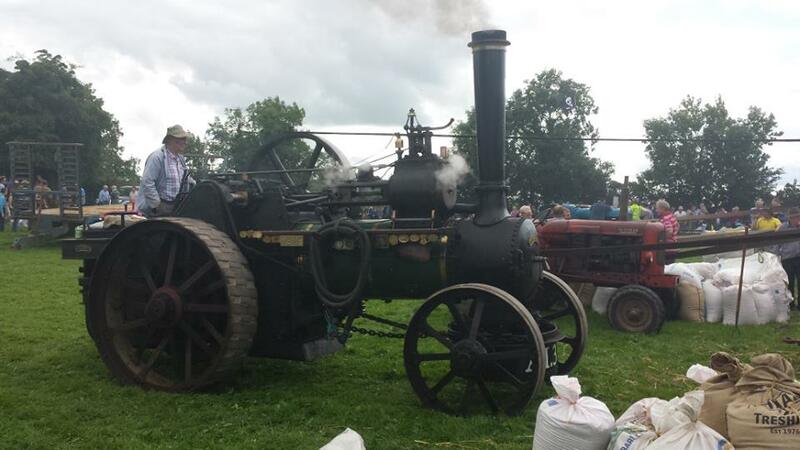 It is lovely to be able to see how things were done “in the olden days” (which is really not all that long ago!). 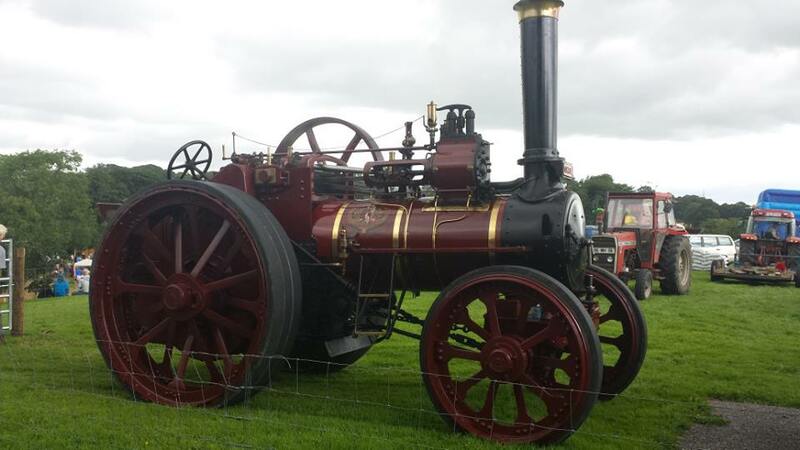 One of the many steam engines. The kids love to hear the whistles blow! It’s classic. 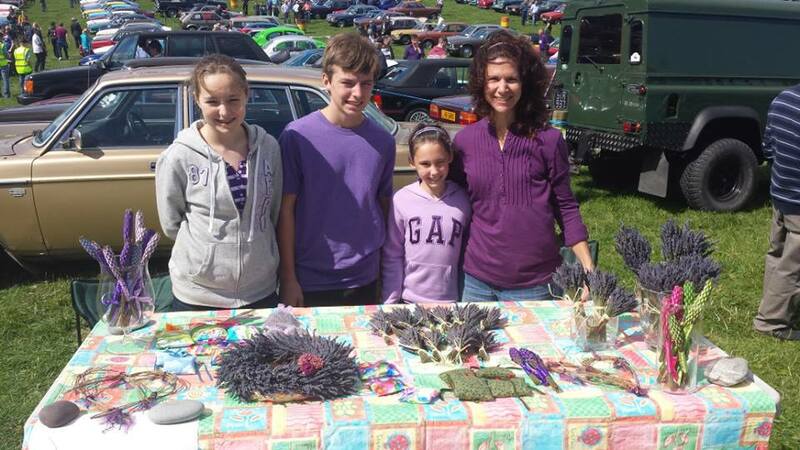 Selling lavender at the festival with my helpers. 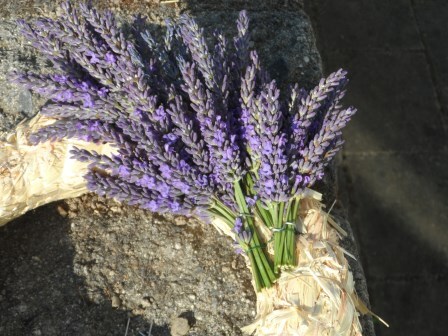 Having gone to the festival for years, I decided that it would be a perfect place to sell my lavender. My lavender display was set up in the vintage car section. I have to say that really, lavender sells itself! The scent was enough to get people to come over to me (that’s the hard part!). I think it worked well with the different variety of items that I had. 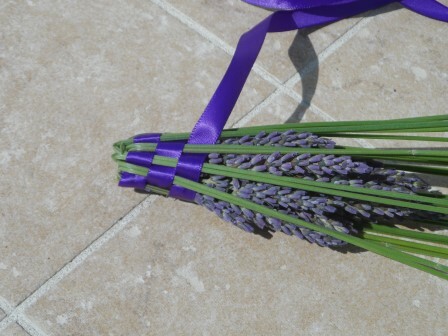 I sold my lavender wands, mini-bouquets, larger bouquets, and two different sized pouches (sachets). It was a lovely day! 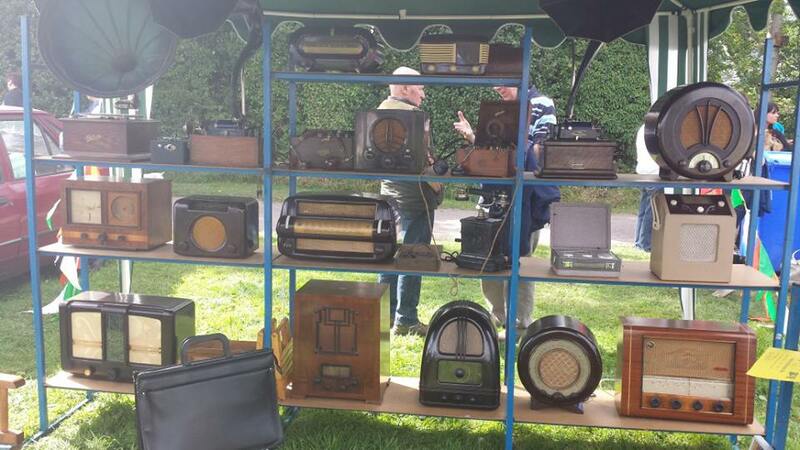 It is always nice to find a fun festival to visit. p.s. I most appreciated my husband taking all of the wonderful pictures in this post while I was busy selling lavender! 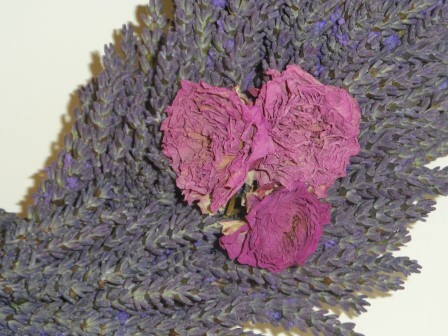 Lavender wreath with dried roses – all from the garden. I love lavender! Better still, I love having lavender in the garden. Even just brushing past it produces the beautiful lavender scent. 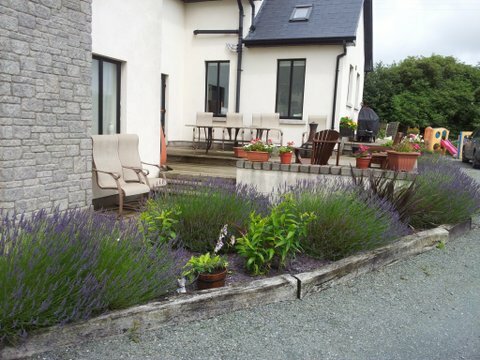 July is the month for lavender here in Ireland. I have lavender that can be quite showy, especially this month. I was delighted to see 5 established plants when we moved into our home three years ago. I don’t know their exact variety, but I think they are possibly Grosso Lavandin, or maybe Lavandula x intermedia. I will admit that I am really not sure! My lavender – possibly Grosso Lavandin (or maybe Lavandula x intermedia!). 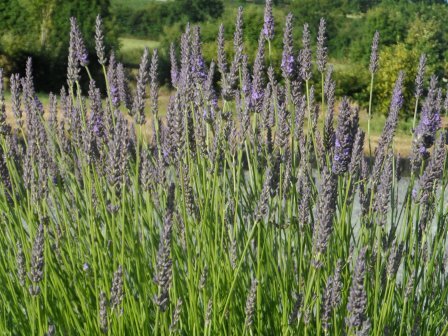 Lavender prefers well drained soil, and lots of sun. Honestly, I’m not sure why my plants do well. This year, sure, it has been sunny and dry, but this is certainly not the case every year. Last year was exceptionally wet, and I really thought the plants were lost to root rot. At the end of last year’s season I trimmed all of the stems off as I do every year (cutting off about 2/3 of the stem). But I didn’t expect them to survive. In fact, I ordered some more plants! 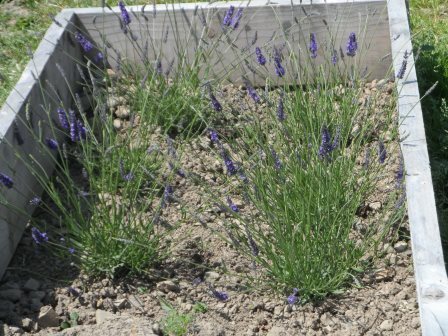 Lavender angustifolia in a raised bed. Six new plants! Lavender angustifolia seemed to be a similar variety to my plants. I put them in a new raised bed. They seem quite happy! My well established lavender plants. It really is a fantastic amount of lavender. 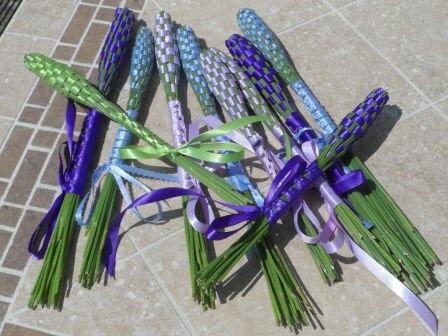 Just this season I’ve made 24 lavender wands, and one very full wreath, and I still have a lot left to dry. Yay! The first year we moved into the house my sister-in-law suggested that I really should do something with all of that lavender! She was right, and so I started with just drying the flowers. 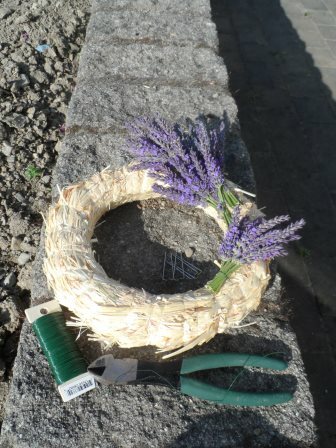 Then with suggestions from friends, I moved on to making lavender wands, and this year I added making a wreath. Materials for making a lavender wreath: a wreath form, floral pins (some are in the center of the wreath), some floral wire, and a wire cutter. Floral pins to attach the bunches. Making a wreath is easy, once you have the right materials. I like using a straw-form wreath. While I was home in the States, I picked up this small 10 inch wreath for just $2.99 at Jo-Ann fabrics. I first tied the small bunches of lavender with some floral wire, and then I used floral pins to attach them to the wreath. That’s it! You just keep attaching small bunches and work your way around the wreath. 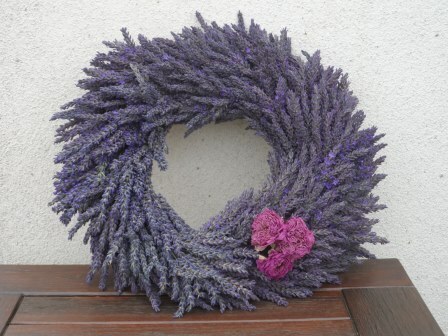 I have so much more appreciation for lavender wreaths now! 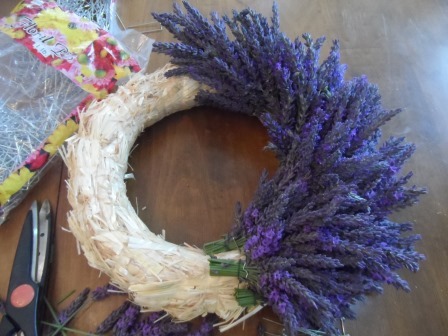 It does take some time to cut the lavender, wire it, and fill in the wreath. It is usually helpful to have some Spanish moss, or some kind of filler for the very outside of the wreath. 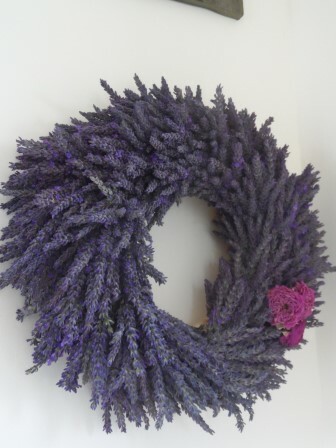 I didn’t have any of that so my wreath is quite full with lavender! Some dried roses from the garden. I’m still not sure about a ribbon. For now, I really like just having the three small dried roses. They are also fragrant! 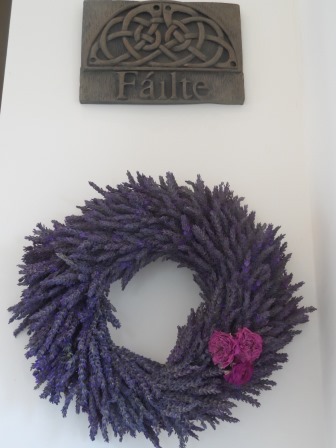 Wreath with our Failte (Welcome) plaque in the front hall. 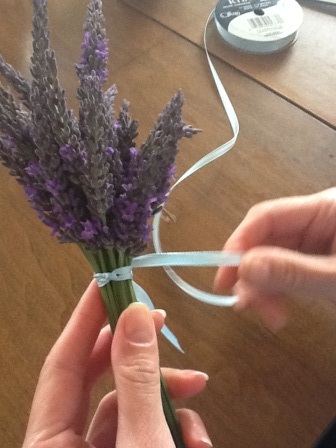 The trick is to work with the lavender before the stems become woody. Last week was the perfect time for mine. I like to have a couple of stems with some blooms open, but for the most part they are made with lavender that isn’t yet open. Tie up a bunch of stems. I use between 21 – 25 stems. 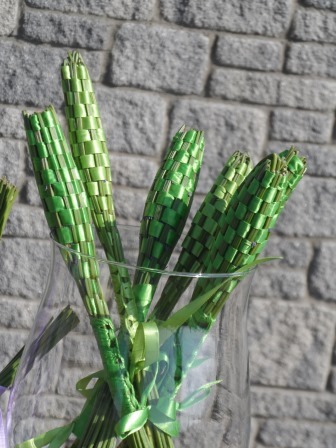 Weave the ribbon through the stems as the stems are folded over. Then pull it tight, and go in opposite direction. I just looked at his page, and with a few tries I figured out how he slipped the ribbon through a loop, and then turned it in the opposite direction to do the same again. Easy! And it keeps the ribbon nice and tight. I’m glad I came across his page! I love all of the different colors. Did I mention how relaxing it is to work with lavender? 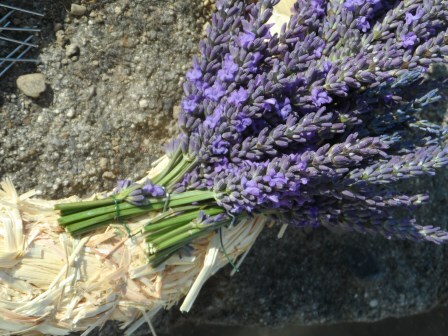 🙂 Between the weaving, and the scent of lavender, I enjoy my time working with lavender. I discovered last year that I could sell the wands, too. So I’m doing that again this year. Right now I’m just selling locally, €5 per wand. But who knows, maybe sometime in the near future I’ll be selling globally! 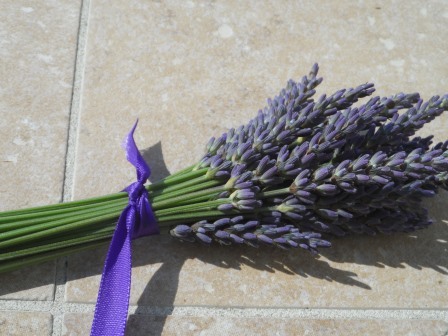 I hope you’ve enjoyed my little lessons on working with lavender! Some other flowers among the lavender. 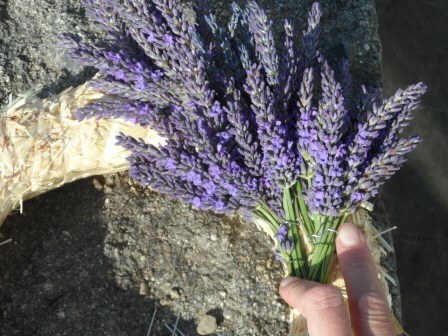 English Lavender in full bloom = Lavender Wands! I like my wands nice and full, so I usually collect between 19 and 23 stems. Look for stems that have some flowers open. Inevitably, one stem will break in the folding-over process, so I’ll end up with 22 which works well for the weaving since I work with them in twos. 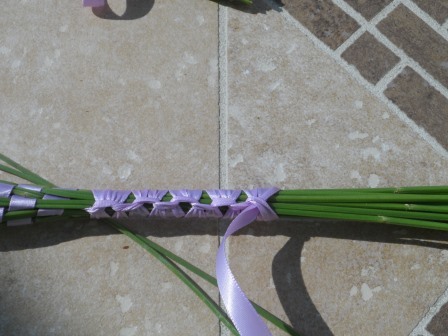 Tie a ribbon at the base of the flowers (not too tight or you’ll break the stems). After you gather your stems and peel off any greens, line up the blooms and tie a ribbon at their base. You can use 3mm, 5mm, or 6mm size ribbon. The wider the ribbon the less weaving you’ll have to do. I think 5 mm is perfect. I figured this out after making lots of wands with 3mm! Folding stems over the flowers. 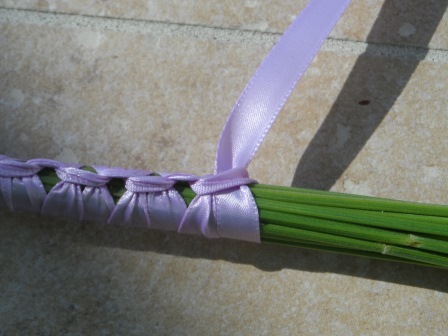 Next, hold the flowers in your hand and fold two stems down (gently, so they don’t break), put ribbon either over or under these two, and bring two more stems down. I use two stems, but you can use one or three. I found one to be too much work. 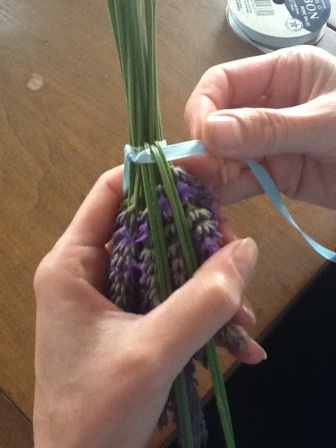 Then repeat the process, bringing the ribbon over and under the stems. I had a lot of fun making these, and putting together a rainbow of colors. You could hang these in your closet, or put them in your dresser drawers, or leave them on the window sill of the bathroom! Because I have so many, I have mine in a vase in my family room. They will last for years. I am going to try and sell them at a fair coming up in a few weeks. 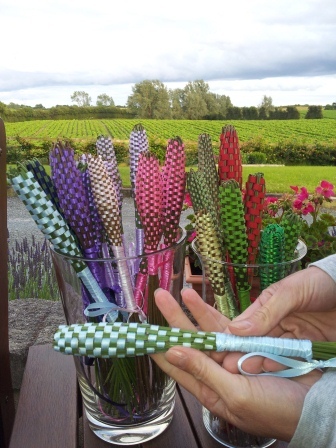 We’ll see if there is any interest for Lavender Wands! English Lavender in full bloom. I can’t be 100% sure of the type of lavender I have since I didn’t plant it. But I believe it is an English hybrid (Lavandins), probably Abrialii. This variety blooms after English lavenders finish their blooming and it lasts to mid summer. 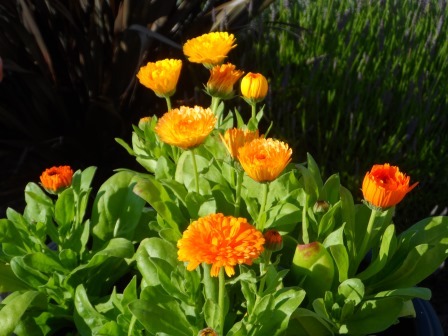 They really have a strong fragrance, and are great for drying too, since the flowers are easily removed from the stems. 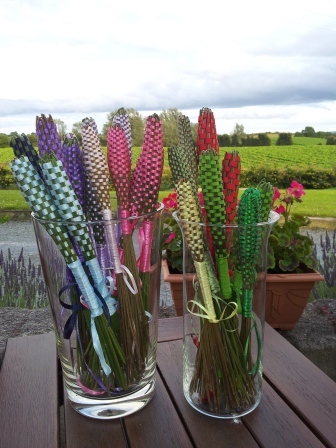 After the blooms are finished the stems should be cut by about a third to promote fullness for next season. I really appreciate having such a lovely and fragrant plant thriving so easily. What a bonus to be able to bring some of it inside and enjoy it all year long! 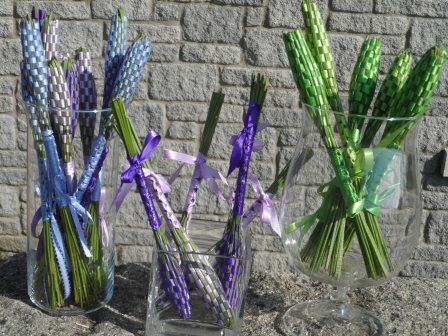 What do you think, would you use a Lavender Wand?